Looking for a meal that’s hearty, healthy and simple to prepare? Nothing is more satisfying than some old-fashioned pork chops, especially when you add some extra flavor. Enjoy the fall flavors of sweet sausage, apple and rosemary in this easy, one-pan pork chop dish that will quickly become your new favorite. 1. Begin by lightly browning your sausages in a large skillet over medium-high heat, adding 1 tbsp. olive oil, stirring and breaking your sausages into chunks or coins when they become firm. Cook until browned and mostly cooked, then drain with a paper towel set aside in a separate bowl. 2. Season your pork chops with salt and pepper on either side, then add them to your skillet with 1 tbsp. olive oil and sear for three to five minutes on each side over medium-high heat. Remove and set aside on a plate. 3. Meanwhile, whisk together your Dijon mustard and chicken stock in a small bowl and set aside. 4. Add your last 1 tbsp. olive oil, sliced apples and sliced onions to your skillet and cook for about four minutes over medium-high heat. Add in your sausage meat, rosemary, sage, thyme, salt and pepper, then pour in the Dijon stock mixture and stir to combine. 5. Place your pork chops back in the pan and continue to cook for another two to three minutes until the liquid is half reduced and the chops are fully cooked. Enjoy! 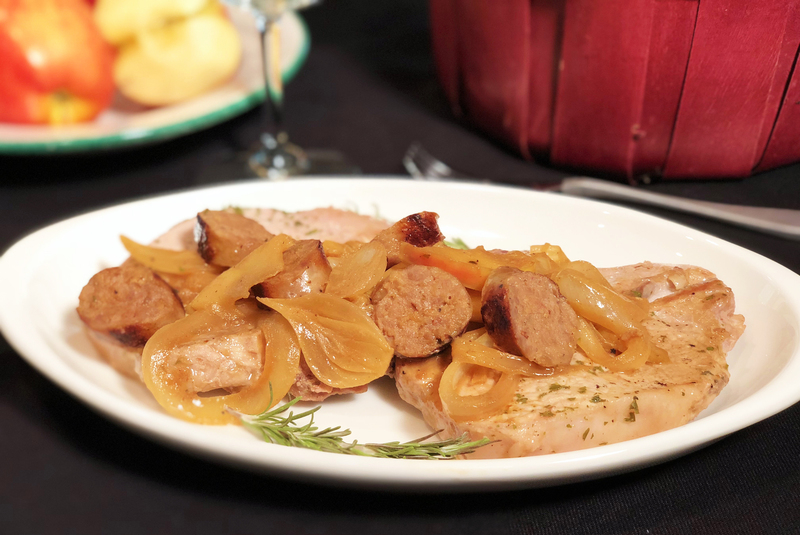 If you love the way Premio Sweet Italian Sausage tastes in your one-pan pork chop dish, you’ll enjoy all our sausage varieties. Find Premio products in a store near you.